Coyote Blog » Blog Archive » Has The US Undermined European Self-Reliance? Has The US Undermined European Self-Reliance? Kevin Drum featured this really interesting Pew poll. This is pretty amazing. 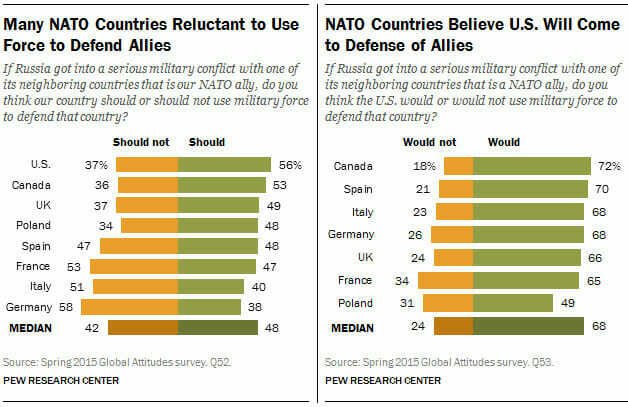 Few European citizens support their country fulfilling its NATO treaty obligations to their neighbors, perhaps because most expect the US to do it for them. The US has undermined the self-reliance of its own citizens so, sure, it's unsurprising it has done the same to Europe. the europeans seem incapable of learning the "appeasement" lesson. this also seems like a basic extension of their socialist beliefs. the problem with socialism is that you eventually run out of someone else's money. the problem with socialized military is no one will pay in in the first place. if they ever run out of our money, then the EU is going to be in water far deeper than they know how to swim in. apart from some UK forces and the swiss, they basically have ornamental militaries, and the swiss are a purely defensive force. in terms of self defense, the EU has been a ward of the US for 65 years. hey, if we will protect you, why spend your own money? mooching is cheap. I think that as things currently stand, the US is the most likely nation along with the UK and maybe some eastern European nations to honor the spirit and full intent of the alliance. However, as time goes on and it becomes increasingly clear that Europe wants nothing to do with its own defense, much less others, I have to wonder when the US will have an "Atlas Shrugged" moment and let NATO die away. Additional thought: But isn't that the point? Europe I think no longer has a strong sense of what it wants to protect. It is hard to feel strongly about defending western values that in our modern era seem gauche and unseemly. The things people take pride in these days seem to be balkanized trivialities of circumstance rather than the grand ideals of the enlightenment that got us to where we are today. Say what you want about ISIS and other like-minded thugs; they are brutish, dogmatic, and are the modern barbarian antithesis of western society, but they are all in on their beliefs. If we are not all in on our beliefs, I fear for the long term survival of our own civilization. A few years back NATO countries were supposed to commit 3% of GDP to their defense budgets but decided to lower that target to 2% of GDP. The US as of last fall spends 4.5% of GDP on defense but only the UK, Greece and Estonia spend more than 2%. Many are under 1.5% including Germany. http://www.mirror.co.uk/news/ampp3d/nato-summit-members-not-pulling-4156751 Europe does not take its own self defense seriously at all. Be careful of the different wording in the two questions. It is "should" your country and "would" the Usa. Thus, it's perfectly coherent for a non interventionist to answer that one ´s country shouldn't mess and the Usa would, but shouldn't either. NATO is not an independent organization—it is pretty much a puppet of the U.S., as most know. One of the better things that happened to NATO is that France, under De Gaulle, withdrew. At the time, this left the USSR facing not just NATO forces, but independent French forces, whom everyone knew would have no problem lobbing nuclear weapons against Soviet forces, as long as such forces were still on German soil. The Soviets were well aware of such, and it made them less adventuresome. I had to check the article to be sure I understood the left side graph. I see no reason to protect Europe if they don't believe it is worth defending. Further, they complain when we do something, and when we don't do something else. The questions aren't mirroring each other as well as you are made to believe by Pew's sneaky framing. Thing is: The second question doesn't check wether or not the responends think it would actually be a good thing for the US to go to war. Just wether they believed the US would do it. Whereas in the first question they are implicitly asked to assess wether they believed such an intervention to be a wise choice. The more you think about it the more insidious you notice this "research" to be. Ask yourselves who manipulates you such and what is their agenda? I detected the same difference. "Assuming Russia got into a serious conflict with a NATO partner and that the US had already committed support, should "our" country use it's military to support the NATO partner"
Russia is much weakened compared to Warsaw Pact days but nonetheless it would still be a formidable foe - NATO should act as one or not at all. The idea of Germany committing forces when the US has elected to opt out is absurd. The original question is ambiguous: should my country fight Russia on it's own - well the answer is no. Some proportion will have read the question like that.